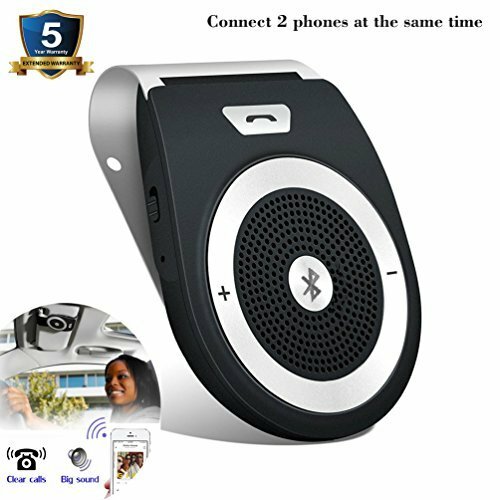 This portable mini Bluetooth Car Speakerphone is specially designed with the purpose of providing convenience and free wireless communication for users. With the double-functional power adapter,this device can be used as hands-free kit both in car or as conference speakerphone on desk when you are at home, in office, etc. With advanced built-in microphone, which adopts D.S.P solution for Echo Cancellation & Noise Suppression, this Speakerphone brings you an outstanding full duplex sound quality. • During a phone call, short press "Answer/End" key twice, the conversation will turn to private call from hands-free state. Bluetooth V4.1+EDR with original CSR chipset, capable of pairing with 2 mobile phones simultaneously within a distance of 10 meters. Work with any bluetooth-enabled devices,including iPhone, Android smartphones, tablets, iPad, laptop or MP3 players, etc. Hands-free bluetooth compatable with Voice prompt battery level, bluetooth connection status and GPS navigation. Built-in high sensitivity microphone with HD-Voice and Noise cancellation DSP technology delivers Crystal clear sound. Muti-function speakerphone:answer calls, hang up calls, reject calls, last number redial, volumn control, play music, switch between car speakerphone & mobile headset. Easy installation. This speakerphone can be attached to car visor directly by metal clip(included), convenient and easy to touch. One in-car charger and USB cable included so that you can charge this speakerphone any time; Ultra-low power consumption, with up to 20 hours talk time and 60 days standby time. If you have any questions about this product by TIANSHILI, contact us by completing and submitting the form below. If you are looking for a specif part number, please include it with your message.